This is Part 3 of the “Cleaning Up the ‘Chan v. Ellis’ Mess” commentary series. In Parts 1 and 2, I revealed how we recently discovered that many court exhibits Linda Ellis provided were of poor quality, flawed, altered, and incomplete. I believe it was a sneaky, intentional act by Linda to shield or skew certain facts that she did not want the lower court to see or know. Her lawyer, Elizabeth W. (Betsy) McBride did not do herself any favors by failing to vet her client’s so-called exhibits. The ELI support group saw her performance in the court transcript, the legal briefs, and her strange attempt to interact with us on October 7, 2014, and, of course, the very poor showing of her oral argument. Through strategic concealing, cropping, obscuring, and altering the photocopies of the original forum posts by Linda, the true context of the forums posts were greatly skewed against me. Because I didn’t have access to my computer or the original posts in the courtroom, I was forced to make do with the poor quality, cropped, altered, and deceptive Ellis exhibits. Since the Georgia Supreme Court decision went unanimously in my favor, Linda has once again embarked on a campaign to smear my name by, once again, providing out-of-context material to the general public through her postings throughout the Internet. I am directly challenging and calling out most of her false, incorrect, or exaggerated assertions. Linda continues to assert that my sometimes veiled and cryptic references to Marietta, Georgia is an indication that I might be following, visiting, or “stalking” her home in Marietta. In the lower court, Linda presented this as her “evidence” that I might be “stalking” her. Surprisingly, compared to her other exhibits she submitted as “evidence” against me, this particular exhibit is relatively intact albeit hard to read. Read plainly, there is nothing sinister about this online discussion. Robert spoke with me on the phone and I told him I was on a date with my girlfriend traveling to Georgia Rib (restaurant) for a Valentine social event. 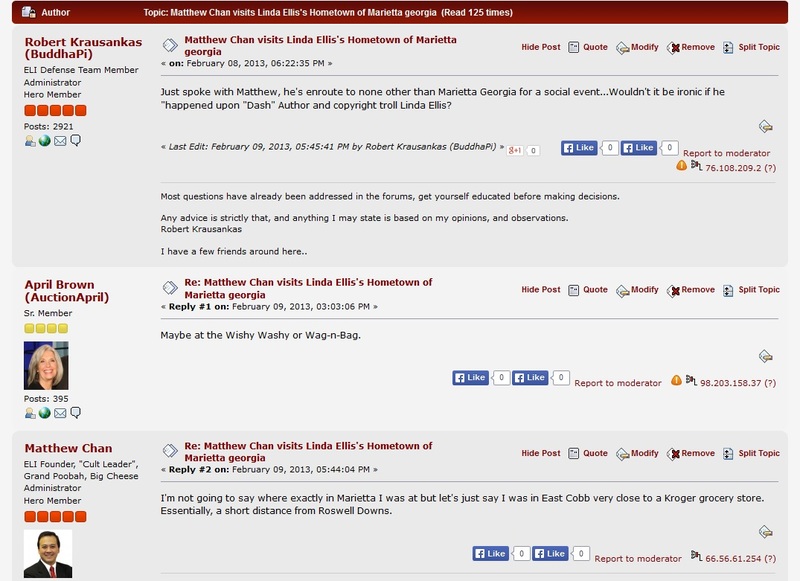 Because it is common knowledge to many ELI regulars (as well as those who receive her Linda Lyrics demand letters) that Linda is based in Marietta, Robert posted an “inside-ELI-humor” remark that would get a reaction from regular ELI users. As expected, a regular ELI user did respond: April Brown. My subsequent “inside-ELI-humorous” reply with the “Roswell Down” reference is plainly directed towards both April and Robert who could easily understand that “inside-ELI-joke”. If Linda had not chosen to read the ELI Forums, it would have no significance to her whatsoever. The ELI Forums is full of “inside-ELI” remarks that have nothing to do with getting the attention of the subject we write about. And yet, because of Linda’s own paranoia and the lower court’s lack of understanding of ELI, her exhibit was considered “evidence” of me “stalking” Linda in Marietta as if she “owns” the city and I have no legitimate reason to be in or traveling to/through Marietta. I want to, once and for all, clear up misconceptions, misinformation, and insinuations by Linda that I might have “stalked” her in Marietta, Georgia. 1. Marietta, Georgia is a large suburb in Cobb County, Georgia. According to Wikipedia, the city has a population over 56,000. It is considered one of the largest suburbs in the Atlanta Metropolitan area and covers over 23 square miles. In plain terms, a lot of people live there and it covers a wide area geographically. It is much larger than most people realize. 2. I lived in Marietta from 1997 to 2000, a full 3.5 years. Although I traveled a lot, I lived and worked in Marietta. I also bought a small home as rental property. A tenant lives there that I visit from time to time to inspect the property. 3. Marietta has organizations that hosts many businesses, stores, attractions, events, and social and cultural events. I occasionally attend them with or without my girlfriend. 4. More recently, one of my Georgia lawyers is William J. McKenney. He is a long-time friend and associate of my New York lawyer, Oscar Michelen and that is how Mr. McKenney came to my appeal case. I have met with him a number of times personally in the last two years and plan to keep touch with him. The irony isn’t lost on me that Linda traveled to Columbus to hire a lawyer to represent her. And I then, in turn, traveled to Marietta to have Mr. McKenney represent me. There was no subtle, sinister message towards Linda at all. Although I admit I was amused at how it might have outwardly looked to her and her cohorts. 5. Roswell Rd (GA-120) is a major 30-mile travel thruway between North Fulton County and Marietta/Cobb County. There may well be over 100 subdivisions and hundreds of businesses in that 30-mile stretch. When I am in North Fulton County, I sometimes have a need to travel to or through Marietta using Roswell Rd (GA-120). Likewise, if I am in Marietta or Cobb County, I sometimes have a need to travel to or through North Fulton County. Unfortunately, Roswell Road (GA-120) is the shortest route (albeit an unpleasant one due to the numerous traffic lights). 6. Linda’s subdivision is only one of 100 subdivisions that are scattered off of Roswell Rd (GA-120). This large residential area is known by the locals as “East Cobb”. It is a 15-20 mile stretch that covers dozens of subdivisions off of Roswell Rd (GA-120). 7. Despite one snarky post to do a “paparazzi” video, it has never come close to ever happening. I have no intentions of ever visiting Linda in her subdivision. But even if I did have a need to drive into the subdivision for any reason, she does NOT own all the streets or all the homes in that subdivision, nor am I “stalking” her. 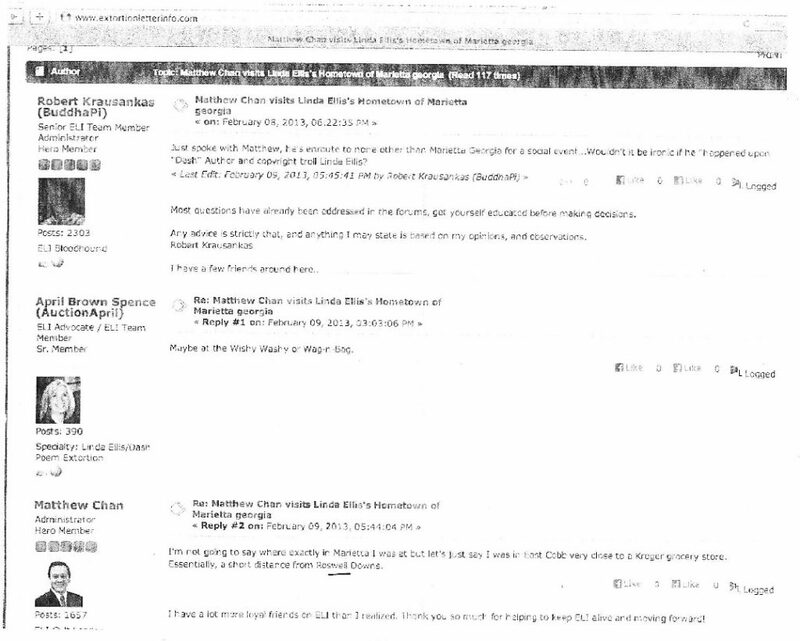 Linda makes mention of alleged “threatening” ELI letters she received. During our February 2013 hearing, when I cross-examined her about it, she said she didn’t have the letter(s) with her. That seemed odd to me because she managed to have photocopies of other heavily cropped, obscured, and altered forum posts in her hands. And yet, a “threatening” ELI letter, she conveniently didn’t have. Assuming that I give Linda the benefit of the doubt and that she did receive a letter she BELIEVED was from ELI, I would want to scrutinize it closely in its entire presentation, content, and appearance. If she did receive any “threatening” ELI letters, they would have to be forgeries or impersonated letters. As far as I am concerned, not a lot more needs to be said until she produces something more substantial than an unsubstantiated assertion. This concludes Part 3. Please check back soon for Part 4.